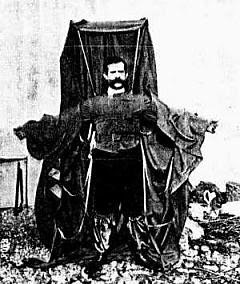 Ok, so the story is actually about a chap with awesome facial hair who tried to jump from the Eiffel tower with a custom made 'parachute suit', but I think we can all agree that it actually looks more like a wingsuit. This all kicked off back in 1912 when Franz Reichelt took the nervous looking steps over the edge. His theory was that his 'parachute suit' would suitably reduce his descent rate to allow him to land unharmed.